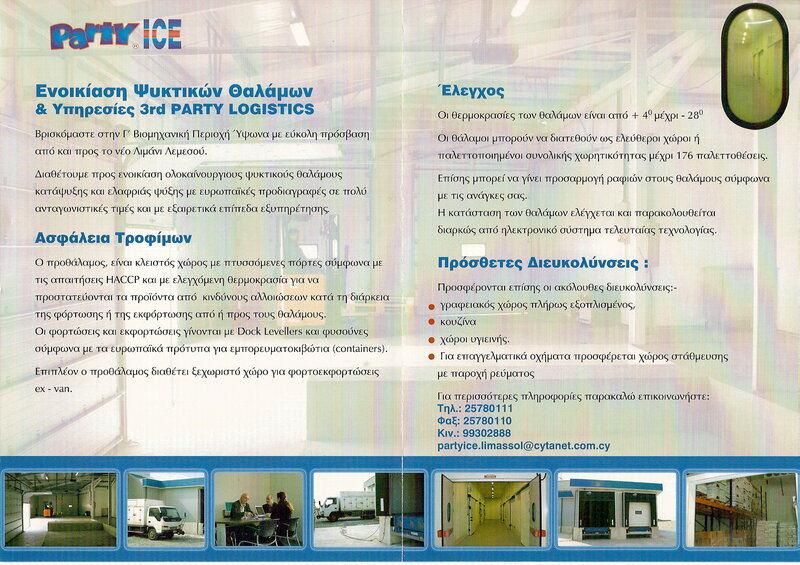 Party Ice Cold Storage, offers COLD STORAGE SPACE in Limassol, ranging from +04¡C (refrigerator) to -25¡C (freezer). We are conveniently located at Ypsonas Industrial Park with new facilities and competitive pricing. Please let us know of your excess products that need immediate storage or perhaps now that you know of our available space, order larger quantities on your next order and get better pricing from your suppliers. Our company is here to help you keep your products safe while complying with food storage regulations. We welcome the possibility to discuss how we can best work together and explore new opportunities. Your Partner in Cold Storage and 3rd Party Logistics. Tel: +357 25 780111 or +357 99 302888.